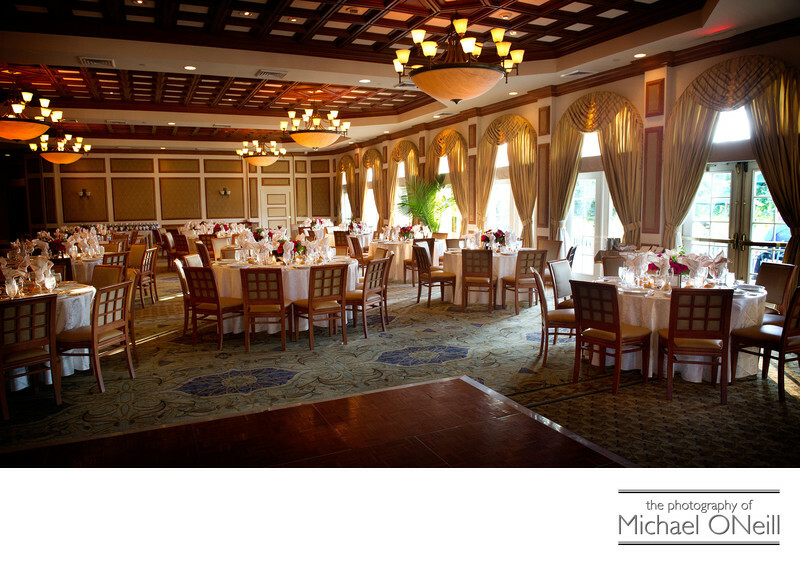 A true country club atmosphere is offered at The Hamlet Golf and Country Club in Commack, NY. Located just 10 minutes from my Long Island studio I have had the experience of photographing weddings at The Hamlet for more than twenty years. The dining room, pictured here, is huge and elegantly appointed. Your guests arrive at the premises through a two story tall entry lobby with a fireplace, elegant furnishings and a tremendous private suite for the bridal party. The grounds are impeccable, as would be expected of any upscale country club and offer unlimited photo opportunities not the least of which is the offering of a dramatic sunset picture over the pond which is just outside the rear of the building (a spot where you and your guests will enjoy an elegant outdoor cocktail hour before your dinner reception). The Hamlet is the former home of the World Championship "Hamlet Classic" tennis match. Elsewhere on this web site you will find additional wedding pictures taken at this extraordinary property.